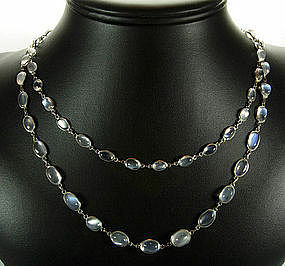 Beautiful long necklace in silver with 60 graduated genuine moonstone oval cabochons in open settings. 1900 - 1910. Not marked but tests positive for sterling silver. Classic Arts & Crafts form and materials. It is a continuous strand but can be worn doubled as shown on the necklace form, by using a necklace shortener clasp or an extender chain clasped. I can provide a shortener or extender if you like. The stones have fabulous luminous opaline color which is not completely captured in the photos. A stunning piece. 34 inches long. The largest stone is 3/8 inch by 3/8 inch. Photos enlarged to show detail. 1930s Art Deco Rock Crystal Necklace 14KT Gold Clasp Hand Knotted 1900 Stylized Snake Form Tortoise Shell Bangle Bracelet Early Vintage Sautoir Big Green Bezel Glass Stones 55"